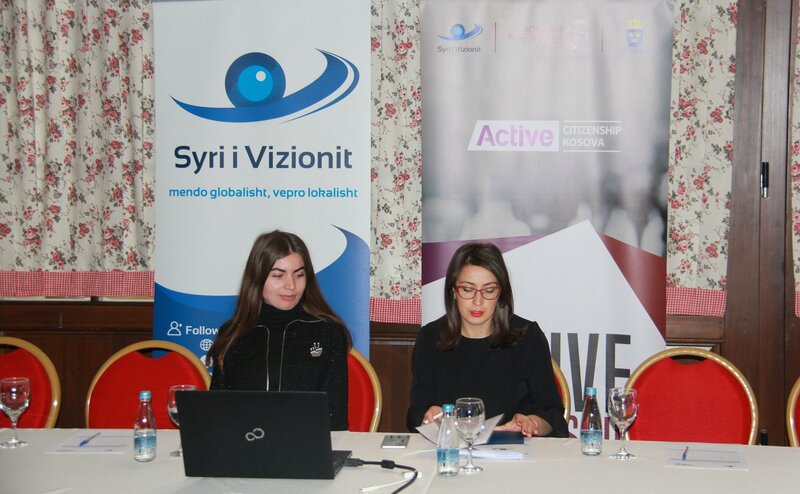 20.12.2018Pejë, December 20, 2018 - The Syri i Vizionit Organization held a press conference today in Pejë, where the work and role of the Liaison Office for citizens and various groups of interests, which functions in framework of the Active Citizenship Program, for six years now, was presented. The Liaison Office, which has been opened in the framework of the "Active Citizenship" project to provide assistance and different counselling is playing an important role not only in empowering citizens, but also the civil society organizations operating in Pejë region and beyond. The complaints, requests and project ideas coming from different citizens and other groups to address them to local and central institutions are also part of the work of this Office. Arbresha Demaj, Project Manager, said that only during this year this Office has assisted in compilation of 100 requests, 50 complaints and dozens of project proposals for citizens and local councils, which were addressed to institutions at the level local and central. “During this year, within the municipality, it was achieved that in cooperation with the Municipal Assembly President, the Director of Administration and the Mayor to appoint a person who will receive citizens in order to address requests, complaints and different issues to the municipality by correctly and timely addressing them to the relevant directorates, and also engaging in the return of the responses,” she said. ”In some cases, during this year, we have supported some of the citizens’ requests with financial means by also involving the municipalities in implementation and support of these requirements,” Demaj added. Such an office is thought to be opened in the following years in the municipalities of Rahovec, Deçan, Klinë and Istog, as the role and the Office that is within SiV over the years has been seen as a very good help for citizens, and is already being tested in the municipality of Pejë. ”Since the functionalization of this Office until today, which is already a six-month period, in coordination with the Syri i Vizionit organisation, it was managed to create a request template with aim of facilitating citizens’ access and addressing of their requests. This Office exists for six years in the framework of “Active Citizenship” program, implemented by Syri i Vizionit with the support of Olof Plame International Center . For more information contact or visit www.aktivizohu.org website.